- When they reach the ski lodge, the CG snowflake effect is not in sync with the camera's motion, causing the snowflakes to look unnatural. - John Pyper-Ferguson, who plays Xander Toth in this episode, also played Tomas Vergis on Caprica as well as Captain Cole "Stinger" Taylor in the BSG episodes Pegasus and Resurrection Ship, Part I. - Coker is from Aerilon. - According to Dr. Kelly, Cylon centurions are capable of feeling pain. - Tricia Helfer, who plays the Cylon-human hybrid prototype in this episode, also played humanoid Cylon Number Six in BSG. - The eccentric Xander Toth rescuing everyone from the evil Cylon space monster and leading them to his hideout in the abandoned ski lodge. 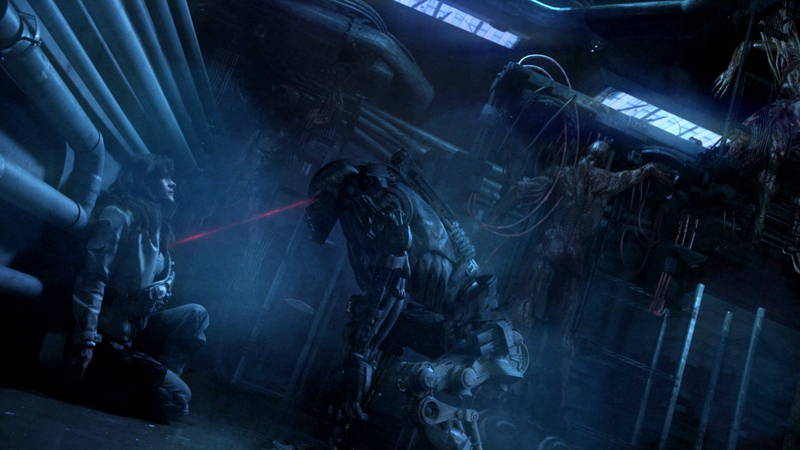 - Kelly regarding the Cylon "screaming" noise: "They feel pain." - Coker suddenly shooting Kelly upon deducing that she's working for the Cylons. - Kelly shooting Coker and doing a tell-all once she realized that Coker's deductions were correct. - The Cylon-human hybrid prototype killing Kelly. - Commander Nash's explanation to Adama of how the mission was orchestrated to fool Dr. Kelly. Ultimately Blood & Chrome's story plays out very much like the rebooted Star Trek movie, Star Trek XI. A younger, more eager version of our hero (William Adama vs. James Kirk) is caught up in a new, sexier, glitzier adventure. Things don't go according to plan and our hero ends up on a barren ice world (the Cylon outpost vs. Delta Vega). The ice world has an obligatory space monster, which is dispatched by a convenient, quirky, temporary resident of the cold, barren world (Xander Toth vs. Old Spock), who ultimately guides him to the final leg of his adventure. After a difficult confrontation with a mysterious villain (Kelly vs. Nero), our unlikely hero saves the day and is given an unlikely auspicious military promotion (special ops vs. Starfleet captain). An unfortunate, but necessary comparison. Anyway, the story unfortunately slows to a crawl in the second half once our heroes reach the ice world, but there are still some good moments. Dr. Kelly intriguingly tells us that the war is going more poorly than the government lets on. This makes sense, given how long the war was and its eventual end in stalemate. At first the fleet of hidden ghost ships is presented to us as a brilliant tactical maneuver; a decisive master stroke even that could decide the war in favor of the Colonials. But in the end we learn both from Kelly as well as Commander Nash that it was little more than a last ditch effort to stave off a crushing defeat at the hands of the Cylons. These stakes are fun to take in and Nash's cynical portrayal of the war as little more than a financial enterprise adds some delightful texture to this period of Colonial history. Had the story been allowed to continue, it would have been enjoyable to expand on the concept that while yes the war was one of survival, that it may also have had an element of corruption of the military-industrial complex as well. Kelly's rebellious act along with the dialog between Nash and Adama at the end all seem to imply that peace with the Cylons was attainable through diplomatic negotiation and could have been achieved much earlier, but there were war hawks in the leadership seeking to prevent that from happening. But the story has not been allowed to continue, as SyFy has declined to continue the pilot into a series. Like Caprica, it ends prematurely without having been given sufficient time to develop. In my view, both shows suffered from the same problem: narrow focus. Had Caprica's dramatic subtleties and Blood & Chrome's masterful action been combined into a single prequel series that properly tackled the epic sweep of the first Cylon war's buildup, outbreak, onslaught, and resolution, then we could have had a concept capable of the critical and commercial success that SyFy sought. Such a series would need to have resembled HBO's Rome or Game of Thrones in depth, production values, and action. The best parts of Caprica and Blood & Chrome combined together could have added up to all that if more careful attention were paid to planning, writing, and budgeting. But I don't know if SyFy has what it takes to embark on a project so ambitious anymore. Overall Blood & Chrome is an even less successful attempt than Caprica to revive the greatness of BSG. It may even serve as the franchise's swan song.